Home Student Life	How do you want to be remembered? The answer was Actions Over Words, the clothing line Levin created before he came to Wilkes. The company’s name is Levin’s definitive answer to the initial question. “I wanted people to do something today instead of putting it off until tomorrow,” he said. Levin had reservations about starting college and keeping up with his business. He is also a member of the Wilkes University Men’s Tennis team, and credits the University and his busy schedule for helping him grow as a person and as a company. 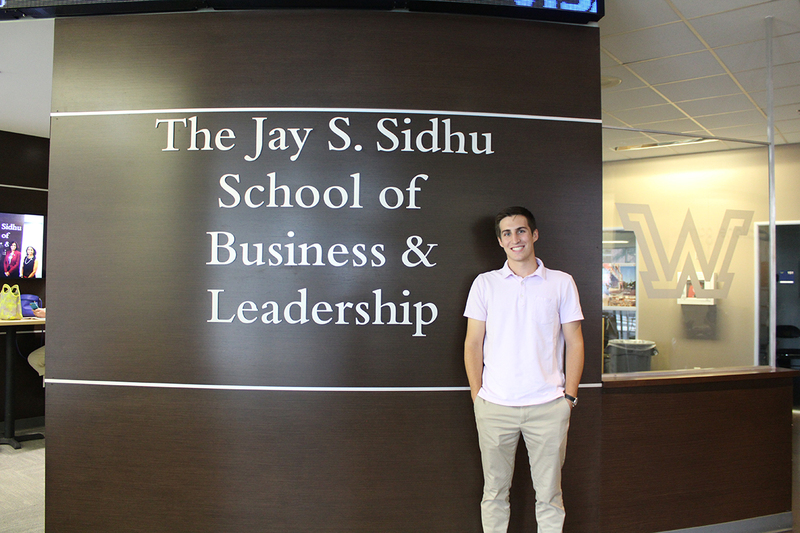 Levin poses in The Jay S. Sidhu School of Business and Leadership in his finished product. 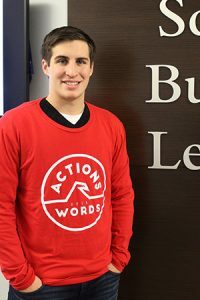 Actions Over Words launched in March 2015, when Levin was a junior in high school. He and his dad came up with the company’s design, a wave concept, to represent his Cape May, N.J., roots and give the line a beach-feel. The apparel features the wave with the words “Actions Over Words” surrounding it. In December 2015, Levin chose Family Promise of Cape May County as his charity and pledged to give $6 from each purchase to the organization. Levin put the video on Facebook on Dec. 18, having raised around $150 at that point. Within 48 hours, the video had 5,000 views and by Dec. 24, Actions Over Words raised $1,700 for the charity.